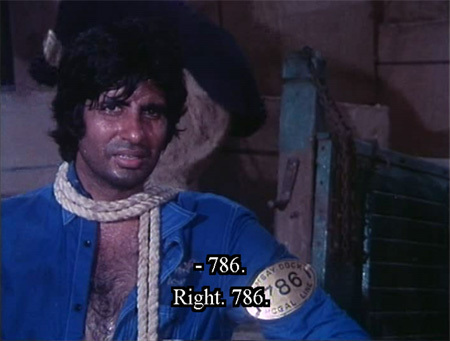 Ram Balram (1980) is directed by Vijay Anand and stars Dharmendra and Amitabh (Dharbh? Amitendra?). 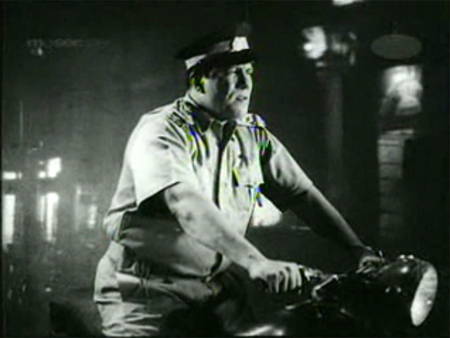 I watched a lot of films early on because they were on lists of Hindi film “classics” that one should watch. Some I remember well, some I do not. This is one that I didn’t think I remembered, until I began to watch it again and realized: “Oh this is where I saw that!” Turns out that a lot of my memories from “some movie” are all from this one. I’m hoping that the memories got fragmented because Hindi cinema was all so new to me back then—I was absorbing so many things, many of which I can take for granted now so they don’t distract me. Otherwise, I need to worry about my brain, because this is a great movie. The script and the performances are pure gold. If I had to put it simply I’d say it’s a story about choices, and the things that influence those choices and shape a human being, and it is done with such finesse that I am left speechless (okay, not really; this is a long post, even for me). It is a brilliantly crafted psychological portrait of the damaged Vijay in particular, supported by simply stunning performances from Amitabh Bachchan and Alankar Joshi, who plays Vijay as a boy. There is nothing wasted—not a word, not a look, not a nuance, not a scene. I normally would not bother writing about this film since Beth and the PPCC have already covered it in their usual stellar and thorough fashion. But they mostly liked this, and I hated it. Part of the reason is that it was *almost* good. It should have been, could have been! It had a great cast and good songs! 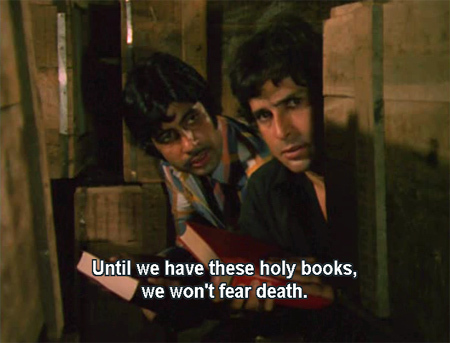 But even the goodness of Shashi+Amitabh is not adequate compensation for being smashed over the head with a sermon that I disagree with, especially when it’s done largely to compensate for the lack of a real script (by Salim-Javed, no less). “Clutch your [Bible, Quran, Gita, other] and trust in your blind faith!” it trumpets. Just the kind of pablum that a world overrun with corruption, greed and poverty needs, right? Thought you’d be interested in our first wheel chair outing. It was exciting to say the least but Dad and I are able to laugh about it now. I had thought we’d take an easy walk ’til I got the hang of it and so headed for 9th St and Harbor View Hospital. I didn’t think the sidewalks were that steep that way but we’d only gone a few blocks before I realized how heavy Dad is so began to think of ways to return. Going down hill I really had to dig in my heels but we were coming along. I finally got down to area where I could cut across by the Town Hall and decided to go down the alley away from street traffic. About half way down I realized I had lost control as speed became a problem. So I turned the wheel chair towards the fence to try to stop it which sent Dad over in wheel chair and I flying face down over the tarmack scraping my nose, cutting my lip but all I could think of was I now understand why so many folk at H House have black and blue faces, By then Dad had rolled out of the wheel chair but I heard a voice asking are you alright. Yes, I replied as I began to get up so he immediately went to dad who was trying to sit up. We soon had Dad back in the chair and thanked the fellow for his help. You’re sure you’re okay. Yes, this is our first run so we are trying out where we can go. Do you have brakes. Yes. You can use them going down hill. Anyway he was most helpful getting us squared around. So I decided on Plan B for return and continued over to the plaza where sidewalk had several openings into the park there. The one I chose mistakenly had large cobbles so of course I got the wheel chair stuck and couldn’t push it out. But I saw one of the homeless guys on a park bench coming over to help so he pushed Dad down to the level spot and then pointed at the walk I should have chosen. From there on back home it was a piece of cake. Thanks to two helpful men. Restores my faith in mankind. Dad says I didn’t get any exercise out of that. I assured him I had. So I told him the gym downstairs was for him to do his exercises and the wheel chair is for getting out and around. We did find if he helps turn the wheels going up hill that helped me but you know Dad he’ll have to learn how to handle that. I’m going to have black and blue areas tomorrow. And a swollen lip but as Dad said you don’t look bad. We were glad we had waited to have tea until after our walk! (-: All’s well that ends well. 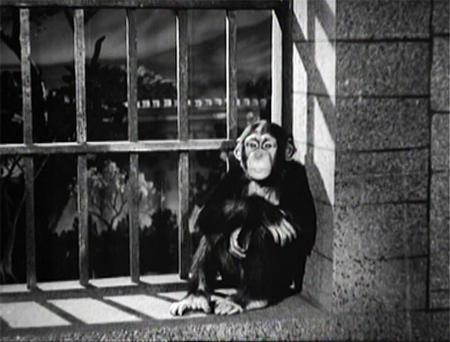 WC Fields once famously said: “Never act with children or animals.” Dilip Kumar and Dev Anand should have listened to him: they are completely overshadowed here by the charisma of a chimpanzee named Zippy. That’s not necessarily bad (or surprising) (I mean, it’s a chimp! ), but I had hoped for a much better movie from these two screen legends in their only real outing together. Gun Master G-9! will…claw your eyes out? 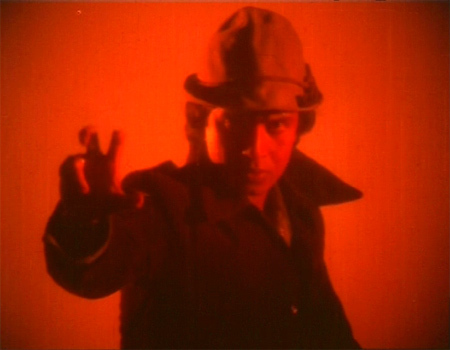 Mithun has been sadly underrepresented in my Hindi film experience—I have only seen him in Disco Dancer, Ashanti (meh) and Ganga Jamuna Saraswati (argh, plus he was totally wasted in it). I don’t really “get” the Mithun appeal based on those three films—I keep hearing what a great dancer he is, for instance, but have not seen any evidence to support it. I’ve actually never seen any evidence that there was any choreography at all in Hindi films from the 80s, so perhaps it isn’t really his fault. 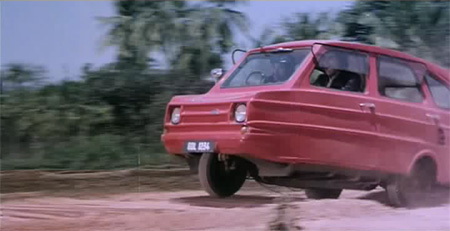 In any case, I thought perhaps I could watch this and expand my Mithun knowledge a wee bit. I was warned against it, I admit, but I’m tired of looking for Surakksha; Gun Master G-9 is Gun Master G-9 after all, right? How bad can it be? Atul and I have bonded over (among many things) our love for the music of the more “obscure” (unfortunately) so-called B- and C-grade Hindi films. Not only do these movies often have lovely songs by lesser-known composers (e.g. Ganesh, GS Kohli), but they very often have straightforward and fun stories too, and they give one an opportunity to see well-known actors as they were starting out (e.g. 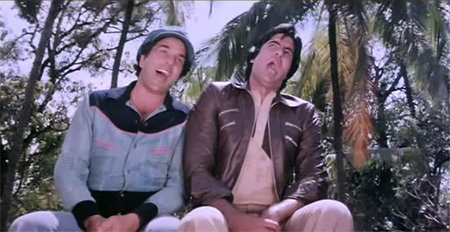 Feroz Khan, Sanjeev Kumar). B-movie directors often had the good sense to give ladies like Helen lots to do, as well. One of my favorites of these guys is Aspi Irani (usually credited as Aspi). He made the delicious Daku with Shammi, and the equally delightful Shabnam, so when Atul recommended Smuggler and kindly offered to send it to me, I jumped on it. Asha Parekh is my favorite heroine in Hindi cinema. There, I’ve said it, and I’m carving it here in blog-stone for posterity. I should also say that in topping that list, she reigns over some of the most beautiful and talented women in film history! I am sure some will disagree with me, but my reasons for picking her are as many and varied as the films she starred in over a very long and distinguished career. She is, when all is said and done, a woman you could steal horses with. This film by V. Shantaram for his Prabhat Films company is quite simply amazing (Kunku is the Marathi version, which I saw; the Hindi version is called Duniya Na Mane with the same cast and crew). It is made with such stark realism and simplicity that it takes your breath away, and the social commentary at the heart of the film seems (to me anyway) to be way before its time. There is also delightful humor (I laughed out loud in places) punctuating the somber and nuanced story, along with powerful performances. Shanta Apte shines as the fierce Neera, a young girl forcibly married off to a wealthy widower old enough to be her father; and Keshavrao Date is equally good as her groom. He begins as a selfish and not so sympathetic figure who evolves into an object of pity, hoping that this marriage will make him feel young again, and loved—alas, it doesn’t quite work out that way.